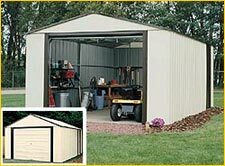 Attractive horizontal siding combines with a vinyl coating to give you a handsome and durable storage solution. A roomy gable roof allows for plenty of headroom and space to work in or hang tools. Interior Dimensions: Width: 118 1/4" Depth: 140 1/2" Ht: 84 3/4"
Door Opening: Width: 55 1/2" Height: 64 1/2"
Recommended Foundation Size: Width:121" Depth: 143 1/4"